What was the coolest extra at the last conference you went to? Was it the promo video, the backpack, a clever attendee badge, decent coffee or even a speakers dinner in a fancy restaurant (for the lucky few)? If you’ve been to half a dozen different tech conferences, you will have noticed that they vary in size but are otherwise more or less the same. You may also have noticed that a lot of the small details are different, and that it’s sometimes an accumulation of small details that makes one conference stand out. Variation is perhaps inevitable, because all of the little extras cost time and money and organisers have to prioritise. It is surprising, though, that the coolest ideas don’t catch on more widely. Note that the following is only about the small stuff, and way less important than what really matters: great speakers, great talks, and wifi that works. Most importantly there are also presentation tips for conference organisers with ideas for how to help speakers deliver legible slides. Everything else is optional. Attendee badges and lanyards are a common target for creative ideas, most of which are mutually-exclusive. 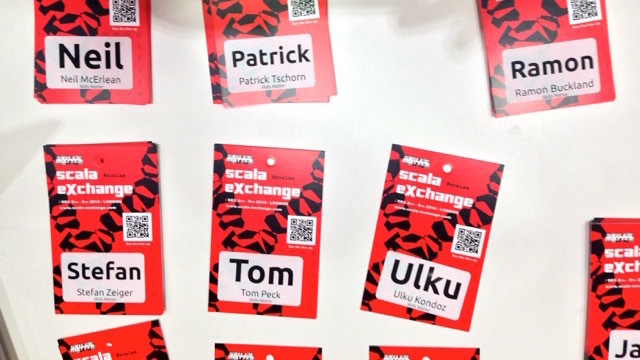 Make the first name the biggest text on the badge, just like SkillsMatter do (photo, above). Although the primary purpose of the badge is to authorise entrance, identifying the wearer to ease introductions is a close second. Add icebreaker tags to the badge as conversation starters. This is just a phrase, more or less relevant to the event, that attendees can complete in an interesting way, either in pen or during conference registration. For example, a web conference might use ‘I wrote my first web application in …’, so you can fill in answers like ‘1999’, ‘Perl’ or ‘constant conflict with IIS’. Joy of Coding printed the answer to ‘What makes me a happy programmer’ on their badges. Print the same thing on both sides of the attendee badge. Otherwise it’ll always be the wrong way around, and therefore effective only about as often as dropped toast lands butter side up. Print additional useful information inside such as a summary of the schedule, or at least a URL to download the conference app that provides the same thing. Use a novelty or reusable object. In 2012, the JFokus badges were (working) new 3.5 inch floppy disks, in different colours according to attendee status. These are durable, cheap in large quantities, served by self-adhesive labels that for exactly and have a convenient lanyard attachment hole in the corner. Later that year, Øredev used a thick plastic rectangle that turned out to be a car windscreen ice-scraper. Collect badges and lanyards at the end of the conference and re-use them because no-one ever does anything else with them, other than decorate their office or throw them away. This of course only be feasible for an organisation that organises regular conferences. A frequent issue for conference talks are technical problems that delay the start of the presentation. Apart from having a technician in every room, there are a couple of things that can help. Provide power/video connectors for recent MacBooks, which is what most tech presenters have, for when they forget their adapters. This will also help them not to lose their own in the first place. For bonus points, provide UK/EU/US power sockets. Get speakers in the room early while there’s still time to fix any problems without delaying the start of the talk. One thing that could help, although I’ve never seen it done, would be to have a test projector in the speakers’ room. Provide seating in the main social area so that people can still be sociable if they’ve had enough of standing around, or of their bags of swag are too heavy to carry. Swag is a minefield of difficult choices, perhaps best left to the sponsors and exhibitors, because you can’t please everyone. However, conferences sometimes have their own good ideas for things to put in the bag. Choose an expensive bag or a cheap one but not something in between. Unless you want to splurge and give everyone a bag that they are seriously going to use after the conference, because it’s better than the bag they already had, then use a cheap bag that attendees will feel less bad about throwing away after the conference. A reasonable compromise are the canvas shopping bags that have become popular recently. Give everyone a book, because you can. A big conference can probably get a cost-effective reprint of a classic book that everyone should read. At Øredev I got a copy of the excellent systems thinking book Freedom from Command and Control, which I probably wouldn’t have discovered or read otherwise. Have women’s t-shirts as well as men’s. Apart from the obvious reasons, there are already enough men’s t-shirts from conferences that languish never-worn at the bottom of drawers, and plenty of women (nerdy and otherwise) who don’t have enough conference t-shirts. Produce mugs because you can never have enough mugs at the office, and you could do worse than encourage companies to try to collect every year’s new mug.